Peter and Karen Huling are empty-nesters who desire to serve the Lord in this new stage of their lives. With their two children out of the home, Peter and Karen realized it was time to “reinvent themselves” and determine what to do with the next step of their lives. They became members of Cornerstone Community Church (CCC) in Westerville about 10 years ago, where they are an older couple to a lot of young adults. At CCC, they relish being involved with young families. In fact, they even sold the home where they’d raised their own family to move to a neighborhood where many young Cornerstone families live. Many years ago, Peter had been an English conversation partner (ECP) with IFI and was interested in getting involved again. While attending IFI’s 2017 banquet, Peter heard two students say that their faith journey began with friendships made on IFI’s fall Hocking Hills Trip. He signed up to be a conversation partner in the fall of 2017 and to go on the Hocking Hills Trip in October. His conversation partner, Jingtao, wanted to go and invited some of his friends. Two other students also joined Peter’s group. It was a wonderful day! When it was time to drop the students off back on campus, Peter invited the students to come to their home for dinner sometime soon. All five accepted eagerly! Here was a chance get to know some Americans better, to see how they live, what they eat, to learn what they’ve experienced and what they believe. The Hulings also invited a young family and single lady from their life group at church. On Thanksgiving, the Hulings hosted more than 20 members of Karen’s family, some people from their church, and their new Chinese friends. The Americans welcomed them warmly. Can you imagine what this welcome meant to students far from their own families and constantly feeling different from the world on campus? Imagine being welcomed by a large, loving family to celebrate an important American holiday, eating new foods together, and telling them about your own culture and family! Before dinner, the group had fun poring over a world atlas and getting to know each other. After dinner, they had a praise-and-worship time, when Peter shared what Thanksgiving means to followers of Jesus, in contrast to Thanksgiving’s secular celebration. The students’ understanding of American life expanded. Other events with the students included a Chinese New Year party when each student received a gift bag of goodies and a Chinese Bible. In the spring, they traveled to Holmes County, Ohio, to visit Amish country. They toured an Amish home and ate at an Amish restaurant. This provided another opportunity to explain the good news to the students after they heard about the unique beliefs of the Amish people. And the students loved eating their way through Holmes County and seeing the beautiful countryside. Summer included trips to a small-town parade and ice cream festival, a backyard cookout and croquet, and a visit to the Park of Roses. 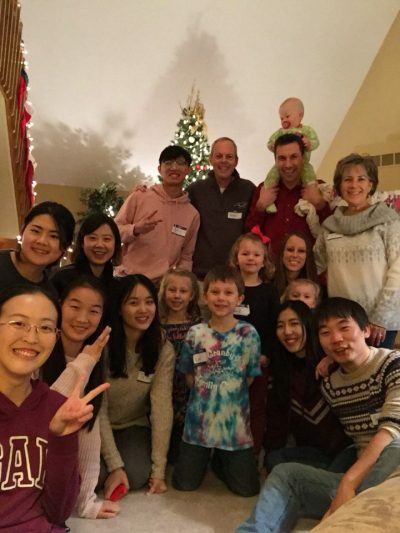 “The young families in our church are so busy with work, house, children, etc., and they ask, ‘How do we find time to serve, to be involved?’ But young families have a natural connection with international students through their children. “What an impact including students in our day-to-day lives could have on our churches, our families, to see ministry happening right at home! What an impact that experiencing ministry as a natural part of family life could have on the next generation! God didn’t intend us to stay in our own little family huddle, isolated in gated communities, protecting our kids from everything that’s out there.